Local Trust - Is your MP supporting you? Is your MP supporting you? We have spoken to a lot of partnership members, Big Local workers, reps and residents and we know that there are some MPs who are doing a great job supporting their constituents to deliver Big Local. Big Local reps have told us that 43% MPs with a Big Local area are supportive of what they are doing through Big Local. Whilst very few MPs with a Big Local area are currently perceived as holding negative opinions of Big Local (3%) that leaves 54% of areas MPs with a Big Local area who are neutral about Big Local. This is a missed opportunity! If you haven’t already, now might be a good time for your Big Local partnership to get in contact with your MP. Tell them what you are up to and talk to them about what they could do to support you. Why is it important to communicate with your MPs now? Big Local areas have made good progress and there are loads of exciting plans for the future. If you do not feel your MP is fully behind you and providing you with support, get in contact with them and make sure they know what is happening. Big Local operates in 150 areas nationally, so there is an opportunity for resident-led approaches to be pushed on to the national agenda. But in true Big Local style this can only be done in a bottom-up resident-led way. 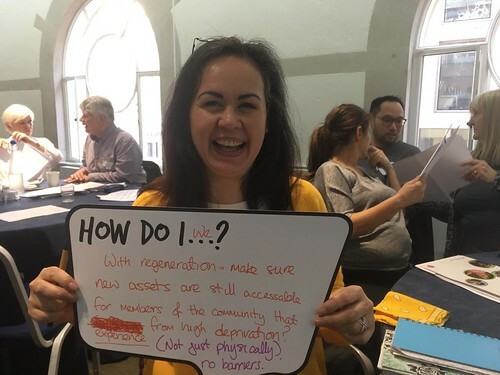 If you want more investment in programmes like Big Local in the future, as well as practical support with Big Local right now, then we need you to shout from the rooftops to MPs about how Big Local is working. For an MP to get behind Big Local, first they must know about it. If MPs know what Big Local activity is happening, even if it’s a behind-the-scenes activity, like consulting residents, they will be more likely to be supportive. Good communication also prevents MPs feeling in the dark. When there's little information, MPs (like anyone else) can speculate about how Big Local funding is being used and whether it's appropriate, and can come to misinformed conclusions. How can Big Local areas work with their MPs? We’ve spotted three ways that Big Local areas are working with MPs that you might also like to use in your area. These are: informing your MP about Big Local activities, inviting MP support to help with publicity and working together with your MP to tackle issues in the area. Informing your MP about Big Local activities: Whitley Bay recently found out how quickly an email to their MP can turn into a meeting. Partnership member and Big Local ambassador Sue Miller knew that Whitley Bay’s MP Alan Campbell had become aware of Big Local but recognised the potential usefulness of more direct contact with him. Sue emailed him to offer an update. They have now met and he is planning to join the group for a walkabout in the area. Getting support from your MP to attract publicity and interest: Tracey Crouch MP has been incredibly engaged and supportive of Arches Local. Most recently she was on hand to open the areas ‘Pocket Park’ which Big Local co-funded. She regularly shares Tweets and Facebook messages about Big Local as well as website articles. This helps the area raise awareness of what is happening through Big Local. Working together with your MP to tackle issues in the area: Wormholt and White City residents keep MP Andy Slaughter informed about Big Local and he is on hand to publicise what is happening through Big Local. The relationship goes further than this though – they actively work together. Andy has made himself available to pick up residents issues referred to him by Big Local. One man referred to Andy by Big Local had had his leg amputated and had waited over nine months for benefits to be awarded. Andy intervened and medical and welfare assessments were offered. This resulted in appropriate benefits being awarded. How can Big Local areas get help with contacting their MP? Your rep will be able to support you, and we’ve also got a ‘how to’ guide on contacting your MP, and a template for putting together a letter or email to your MP.